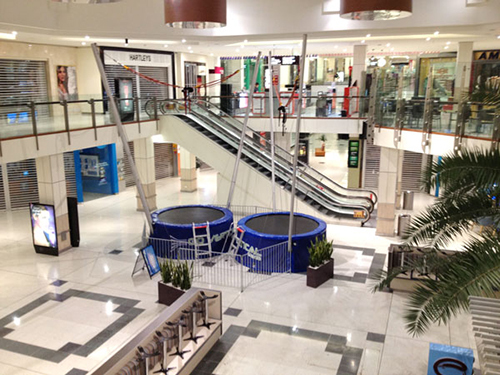 The 2 in 1 Bungy Trampolines are another ultimate “active” Go Vertical Events experience. It has 2 jump stations and is suitable for 10kg to 80kg weights. With the help of the elastic loops connected to the harness, the jumper can reach heights in excess of 8 metres! The 2 in 1 is a guaranteed physical and mental challenge, the participant has to actively jump, whilst overcoming the mental challenge that comes with defying gravity and perhaps even performing somersaults! The 2 in 1 Bungy Trampolines cater for any event, from Corporate Functions to School Galas, Product Launches and Private Parties. When paired together, the two, single bungy trampolines, offer a higher turnover rate than the standalone – single bungy trampolines, however, they still maintain a small footprint, making it ideal for those events with limited space.